Ideal starting point to discover the bay of Mont Saint Michel and the Emerald Coast, the hotel restaurant “Les Quatre Salines” is located in a small village of the polders of the bay, at 10 minutes from Mont Saint Michel and 25 minutes from Saint-Malo. 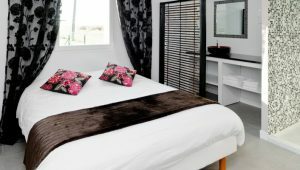 New and comfortable hotel, you have four types of rooms adapted to your needs. Whether you are a young couple or a large family, you can enjoy free Wi-fi and a bathroom and WC. 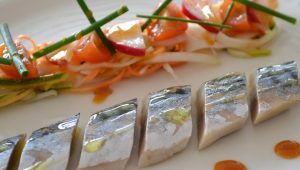 In addition to your hotel room near the Mont Saint Michel, we offer you a taste of quality cuisine based on local products! Discover fresh and local Norman products in a refined and delicate setting. Our Chef Cook invites you to revisit Normandy gastronomy by tasting lambs from the salt meadows of Mont Saint-Michel de Mathilde, Arnaud’s seasonal vegetables and dairy products from Ferme de Ville-Prêtre. Your hotel Les Quatre Salines can now accommodate in the best conditions people with hearing, mental and motor disabilities through dedicated facilities and services! Do not hesitate to contact us to find out more !